The amount of 0.5 USD has been deposited to your account. Accounts: U7594488->U1136717. Memo: Shopping Cart Payment. Withdraw to hyipsinfo from Luxearn.. Date: 19:32 14.10.18. Batch: 232142761. The amount of 0.3 USD has been deposited to your account. Accounts: U7594488->U1235766. Memo: Shopping Cart Payment. Withdraw to FMonitorru from Luxearn.. Date: 18:22 16.10.18. Batch: 232380613. 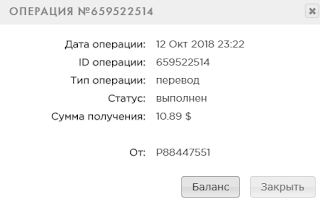 The amount of 0.3 USD has been deposited to your account. Accounts: U7594488->U1235766. Memo: Shopping Cart Payment. Withdraw to FMonitorru from Luxearn.. Date: 20:04 17.10.18. Batch: 232516394. The amount of 0.75 USD has been deposited to your account. Accounts: U7594488->U1136717. Memo: Shopping Cart Payment. Withdraw to hyipsinfo from Luxearn.. Date: 20:34 17.10.18. Batch: 232519228. The amount of 1 USD has been deposited to your account. Accounts: U7594488->U3669097. Memo: Shopping Cart Payment. Withdraw to DaTre from Luxearn.. Date: 18:27 18.10.18. Batch: 232621184.